That graph is from when I restarted through today. Was the year perfect? Nope. But I ended 2013 17.3 lbs less than where I started it. That’s good. Blog. Yeah, we’ll see how that goes. But when I was losing, I was blogging. So we’re going to try it again. I wasn’t very good with it this summer and fall but I was thinking about blogging even if I never got to writing. On the writing theme, I’m tracking. I was a master at tracking way back when and it’s time to go back. I don’t see what my road block is here. I face the foods when I see the number on the scale, it’s time to face it in my tracker. I tracked today. Including the m&ms. That’s a start. I have been very good at tracking. I’d say 95% overall, when I don’t it’s not because I don’t want to face it, but rather because I leave it too long and don’t catch everything. But I still give myself an A- here. ETA: I almost didn’t track Christmas but then felt guilty. So I went back and tracked it. It wasn’t pretty but I dealt with it. Money. I joined Run With Jess‘ DietBet challenge at the instigation of a Hive friend. It cost me $10 but I will lose my 4% and if I do that every month it won’t cost me another cent I don’t think. AND if I hit the 4% goals each month (a big if, I know), I’ll hit goal by July, which gives me plenty of breathing room if I have an off month. 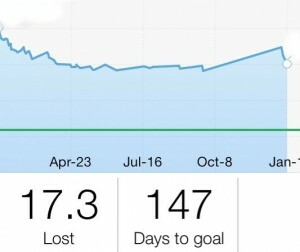 Well I didn’t hit it in July or September, and I got bored with DietBet partially because I wasn’t losing at that rate. I ended up buying the iPad I was thinking of anyway and I love it. ETA: thinking of starting a DietBet again to kick start me. #GoTheDist. I gave up on tracking this a chunk of the way through last year although I continued to track my workouts in MapMyFitness. But the challenge is a great motivator and it gets me to the gym when I don’t want to go. A+ here. I beat my goals and tracked throughout the entire year. Smoothies. Yep, back to smoothies for dinner. They help with the salt retention and they give me my chocolate fix when I otherwise eat things I have no business eating when I get home. This didn’t last, I lost my appetite for them. Do I miss them for my chocolate fix? Yes. I’m not giving up soda. Not yet, at least. I was the queen of fake lemonade last time and while I’m contemplating getting a soda stream, I’m not ready to make the switch off soda. I’m afraid I won’t drink enough until it’s warmer. But it’s diet soda so that’s a partial win. I’m drinking too much soda, and probably too much coffee, but that’s not changing right now. S is for Spark. as in the Spark to get to goal. As in SparkPeople. If I do what I did with Weight Watchers online, I can make it work with Spark. There is no difference in the foods I’m eating. 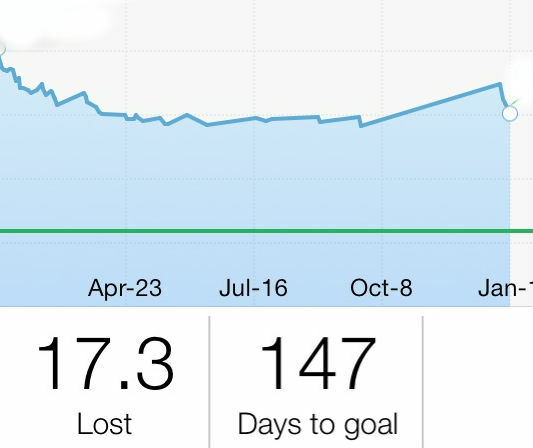 I love LoseIt, and as I mentioned above, I’m tracking. I’m going to get my knees to the point where I can do more than one squat, or I’m going to quit putting off knee surgery and get it done. This one is still up in the air, but my knee isn’t holding me back too badly. Exercise everyday. It doesn’t have to be the gym, and my 64 stairs a day probably count anyway, but with the weather getting nice there’s no reason not to spend some time outside walking, etc. Especially because I’d really like to finish the Great Manhattan Loop. One thing I realized when I was home for about ten days in July is how much I walk by default when I’m here. There are sloth days, but I think I’ve been good on this step. And I finished the Loop and have started on another goal with the bridges. Eat better. Not just within the calories, but more fruits and vegetables. It’s the perfect season. Eh, sort of. I give myself a C here. ETA C-, but I’ve been a B+ of late so I’m getting back. Diversify my breakfasts. I’m getting sick of Cheerios. I think there are better options to keep me fuller too. Straight up D here. It’s coffee, cheerios or both. 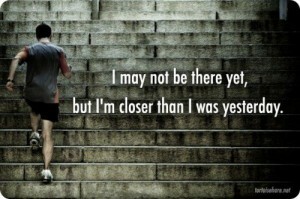 Set a goal. Maybe even a Goal. Time to figure out what I’m working toward. F. F – if possible. 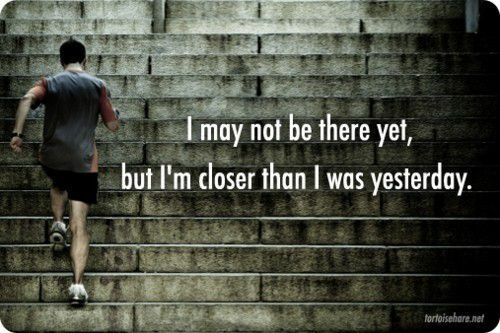 Stay on track and finish strong. Fall is crazy at work, but that’s not an excuse to undo all the progress I’ve made this year. I wasn’t perfect, but I was pretty good. I didn’t gain over my birthday, Thanksgiving, the gala or vacation. I’m happy with this. #GoTheDist Q4. Detailed yesterday. Detailed above. Nailed this. Better food choices. Goldfish aren’t dinner and coffee isn’t breakfast. No comment. So mixed results, but I’m overall happy because I kept thinking about the goals I’d set and why. So, with that in mind, here are some ones to start 2014. Meet or exceed my #GoTheDist goals. Specifically, exceed my Q4 2013 GTD totals. Learn to cook. I’m already laughing at myself for this one, but I really wish I could. I think it would make some food choices better. Relax. Keep doing what I did last year. It (mostly) worked and I’m on the right track.